During the holiday season Team Music Is Love and hunger fighting nonprofit One Gen Away partnered with the Amos Foundation to give Nashville a free holiday community dinner. 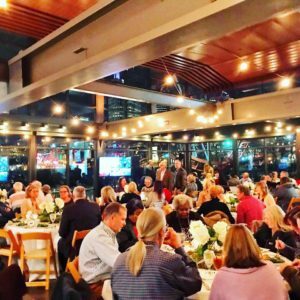 The dinner was hosted at the Bridge Building overlooking downtown and aimed to bring people from all walks of life together to help combat hunger and loneliness during the holidays. One in seven people in Middle Tennessee may not know where their next meal is coming from and one in five children struggles with hunger. Team Music Is Love has partnered with One Gen Away for two years to hold free food distributions in Nashville and on Martina McBride concert tours around the country to provide nutritious food to those in need.